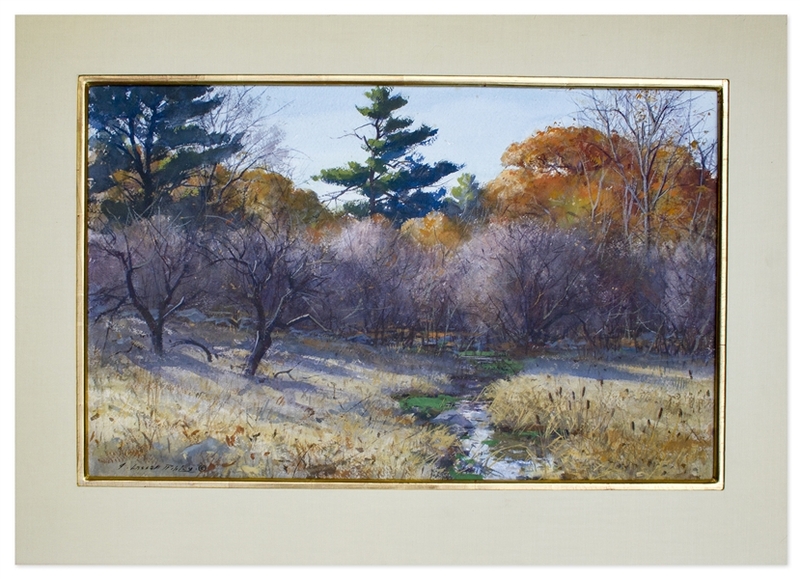 Twentieth century American artist, Aiden Lassell Ripley painting of his signature sporting scenes entitled ''Woodcock Shooting: Woods and Meadow Brook''. Composed in watercolor and gouache on paper. Signed ''A. Lassell Ripley. c'' at lower left, and again signed and titled upon the reverse. Measures 17.5'' x 26''. Hinged to mat, with two pieces of tape along the upper edge of reverse. Artist's pinholes along margins, and light toning along top center edge of paper, with slight buckling. Minute foxing to sky. No restoration. Overall very good condition.